This is a black and white snapshot of Antoinette (Toni) Ciccarelli sitting on the grass smiling at the camera. 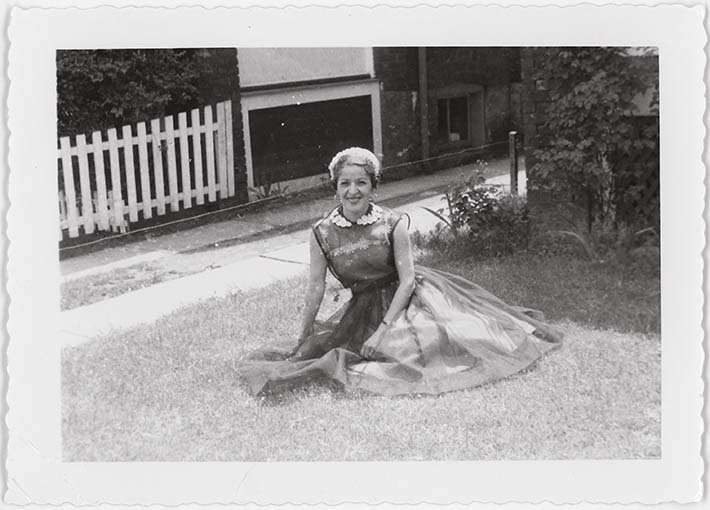 She is wearing a dress with capped sleeves and a full skirt. Floral patterns dot the high collar and chest area of the dress. She is wearing dark tinted lipstick, round hoop earrings, a watch, and a hat. The building structures in the background look like houses and there is a white wooden fence to the left rear.